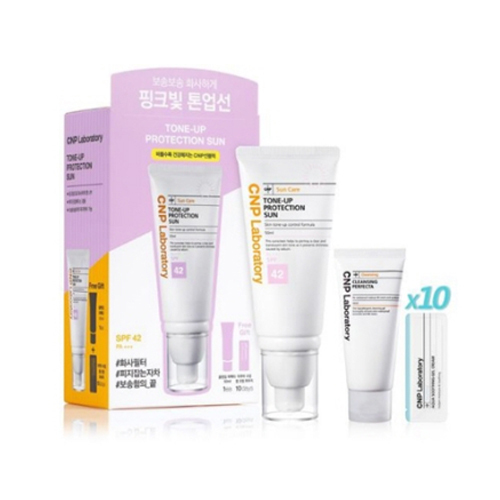 This set contains Tone-Up Sun Protection Sun(50ml) + Cleansing Perfecta (Mini Size) + Soothing Gel Cream Pouch. *Tone-Up Sun Protection Sun is a sunscreen that protects the skin from UV and also acts as a base makeup with ultraviolet protection. * Cleansing Perfecta is a specially formulated hypo-allergenic oil-free deep cleanser targeted at all skin types to remove makeup. * Soothing Gel Cream cools down skin temperature immediately. -Sunscreen: Take a proper amount, apply it over the area exposed to UV. -Cleansing: Take a moderate amount, gently massage face, rinse thoroughly with water. -Gel Cream: Apply an appropriate amount to be absorbed into dry and dull face.